Without question my favorite holiday is Thanksgiving. It's all about the food. No presents, decorations are not required; it's about sharing a special meal with your family, and if you're lucky, great friends. I count myself doubly lucky because not only do I get to share Thanksgiving with my family - but my friends have a 3 year tradition of celebrating Thanksgiving a few weeks early. Everyone brings a dish (or 2, or 3...) that is the presumably one of the best at their family gatherings....Beyond the traditional turkey and trimmings we have a full fleet of appetizers and some amazing desserts. "Sure its all fun and games until it starts getting competitive. Then someone starts calling you by your last name and telling you to hustle"
This year's PTD took place on Saturday. Once we got a little bored with the football game we headed back inside and start drinking wine, chatting, and munching on appetizers. We made sure to get our fill before the boys came in and polished off the food. This isn't my best photography - but trust me - this was amazing. 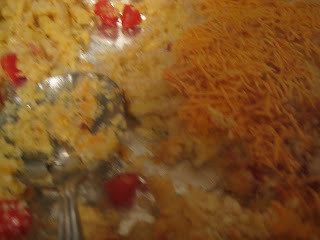 Delicious crab dip from Sara. This was served on top of cocktail bread - rye and pumpernickel. 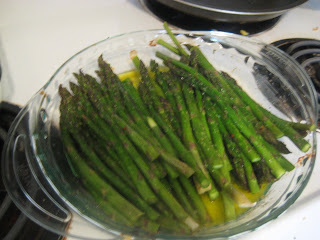 Abby made one of my favorite appetizers in her repertoire. 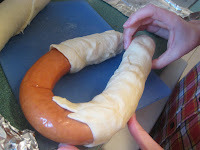 Kielbasa wrapped in crescent dough. The photo on the left is her handiwork, stretching the dough across the sausage....on the right is the finish product. Served with spicy brown mustard for dipping! Featured, but not pictured were the buffalo chicken dip and crab cakes from Molly (girl was a rock-star with her many delicious contributions) and Rafe's famous guacamole. 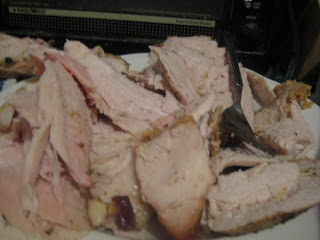 This year, the two turkey breasts were roasted by Abby and Molly - and they were deliciously seasoned and moist. Kudos girls - I know what a headache it can be to be responsible for the main event - and you two knocked it out of the park! 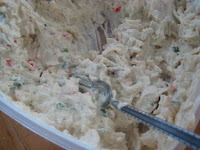 In addition to turkey and gravy we had some amazing side dishes, like the obligatory mashed potatoes by Marcia. 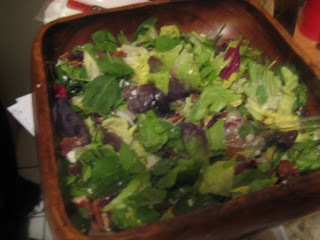 Marcia made this salad that was Rafe's brainchild - mixed greens, dried cranberries, goat cheese and toasted pecans. 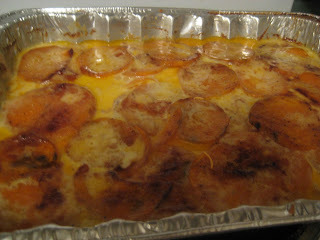 This is Sara's sweet potato gratin....I need to get this recipe. I seriously look forward to this dish EVERY year. YUM! Can't get better than some cheezy sweet potatoes. There was also corn and crescent rolls from Marcia...not pictured...but I'm sure you know what both those things look like. Ty brought the cranberry sauce as usual. After dinner we hung out for a little while and digested before dessert. We wanted to make room in our bellies for the delicious sweet treats! 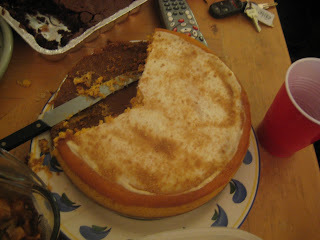 Maggie made pumpkin cheesecake. She promised this was a Paula Deen recipe so I braced myself for an onslaught of heavy, butter-filled cheesecake - but I was pleasantly surprised by how light and flavorful it was. It was a nice change from the usual pumpkin custard pie. Kaitlin is a baking master and made these chocolate-chocolate chip cookies that absolutely blew my mind....Can you make these for my birthday and put some candles in them? February 12th. Thanks! 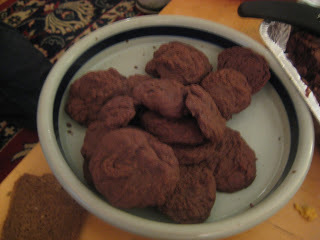 She also made Ghiradelli Brownies, not pictured. Likely because we ate them all. I'll be posting the recipe for this in a follow-up as well! 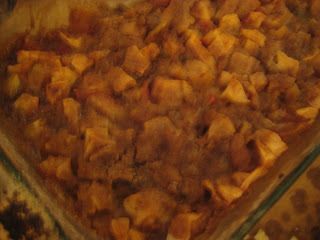 Molly also made an apple crisp. Did I tell you she was a rock-star? 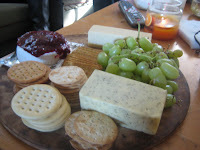 Sorry its blurry Molly - it was yummy though! 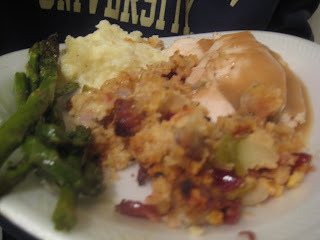 Preliminary Turkey Day was an amazing feast as usual...and lots of fun. I feel very very lucky to get 2 Thanksgivings a year - and clearly - a lot of good friends and good food to be thankful for. I'm off to hit the gym for the next week or so to work off all the treats. Hat's off to everyone in attendance! Thanksgiving squared - phenomenal idea; so impressed you've mastered the turkey, though I can believe you were ready to be done with that task. 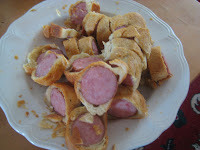 Kielbasa wrapped in puff pastry - my two favorite things! Can't get better. When you get your hands on that sweet potato gratin recipe, please share! I dunno. I'm all about the tomatoes in the Mac and Cheese!